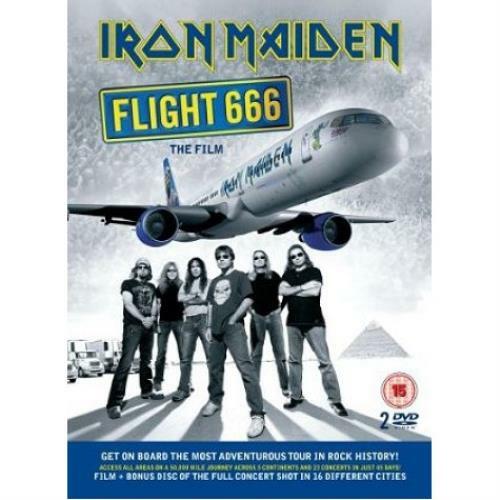 IRON MAIDEN Flight 666: The Film (2009 UK Deluxe Edition 2-disc PAL DVD set - Iron Maiden's historic 'Somewhere Back In Time World' tour in February & March of 2008, is considered to be the most ambitious and adventurous tour in rock history. Circumnavigating the globe in just 45 days, the band flew in a specially customised Boeing 757 airliner, piloted by lead singer Bruce Dickinson, with the entire tour crew and 12 tons of music and stage equipment on board, to 23 sold-out stadium and arena shows in Asia, Australia and North, Central and South America. 'Flight 666' gives a close up inside the scenes look at what happened on and off stage, when Maiden gave full access to a film crew for the first time ever, and contains some of the most spectacular live footage yet seen of Maiden. Taking you from Mumbai to Santiago, LA to Sydney, Tokyo to San Paolo, Buenos Aires to Toronto and all points between, through exhaustion and fan pandemonium, travelling with band and crew on the plane, to and from shows, in the bar and during leisure time, this really is Access All Areas. Comes complete with live performance footage captured during the tour, including 'Aces High', 'The Trooper', 'The Number Of The Beast', 'Hallowed Be Thy Name', 'Iron Maiden' & more. Both discs appears barely played and are housed within the DVD-sized hardback digipak complete with extensive integral picture booklet).